The Education Director leads the Club Fly Tying activities by finding instructors for the monthly classes. Gerry also solicits and gets volunteers for teaching opportunities where the club can promote fly fishing. 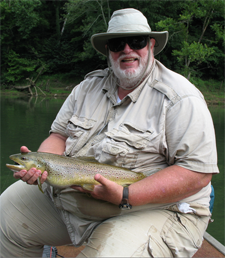 Gerry has been fly fishing for over 50 years and became a Licensed Professional Guide about 30 years ago. Gerry authored “A Guide to the Lower Cumberland River” that contains detailed maps of the river from Wolf Creek Dam to Tennessee. Gerry also holds a Fly Rod World Record by catching a 42 pound 3 ounce Stripper (12 pound tippet class) on a tippet that tested out at 8.1 pound strength.